Pumping tests (or aquifer tests) are used to evaluate an aquifer by abstracting water through pumping, and observing the response (drawdown) in an array of observation wells. From the results, it is possible to determine the hydrogeological characteristics of the ground, which can be used for further design work and for permit application. 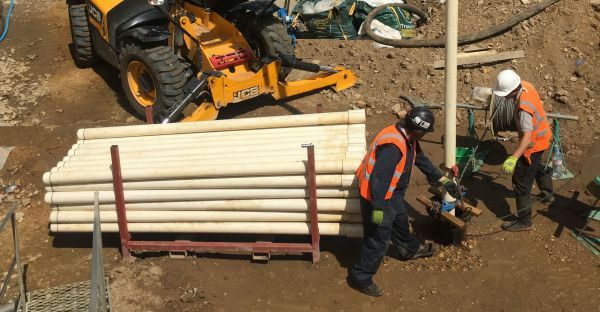 For dewatering projects, the cost of carrying out an initial pump test is typically far less than that of dealing with unforeseen hydrogeological conditions encountered once site work begins. We offer a comprehensive, high-quality pumping test service carried out to Standard BS EN ISO 22282-4:2012. Our tests are monitored with water level transducers and electromagnetic flow meters to provide automated monitoring, with manual measurements provided for confirmation of data. We provide a detailed factual report as standard, and can also offer interpretative reports (with groundwater modelling) as part of our in-house design service. More challenging construction projects often require a greater level of control and monitoring to ensure that performance criteria are met, i.e. water levels and flows. One of the biggest advancements in this area is the use of automated remote monitoring systems, often referred to as SCADA (Supervisory Control and Data Acquisition). In addition to allowing continuous reporting of the current status of dewatering systems, certain plant and equipment, i.e. pumps and valves, can be controlled remotely via SCADA; either automatically in response to input measurements, or manually by personnel located off-site. As Hölscher are able to develop bespoke, project-based SCADA systems in-house, Project Dewatering are able to offer their clients a range of monitoring packages to suit projects of any scope and budget. If you would like more information about this comprehensive, bespoke and innovative monitoring system, or would like a demonstration or consultation with our experts to see how it could benefit your construction project, get in touch today via 01473 658 807 or enquiries@project-dewatering.co.uk – We look forward to hearing from you.